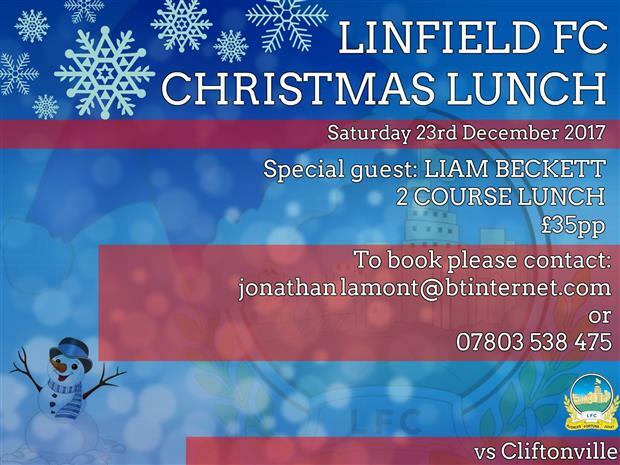 The club's Sales & Marketing Committee has organised a pre-match Christmas Lunch function ahead of the Danske Bank Premiership game against Cliftonville at Windsor Park on Saturday 23rd December. Tickets are now available priced at £35.00 which includes a two course Christmas Lunch with tea/coffee, access to the Joe Bambrick Hospitality Lounge with full bar facilities from 1.00pm - 5.30 pm, a corporate seat in the South Stand and a matchday programme. The guest speaker for this popular event is former Irish League player and local football pundit Liam Beckett. Places are limited so reserve your ticket now and these will also be available from the Windsor Superstore before the game against Coleraine on 18th November.